This is the world's first full-function water conditioner. With everything you need in one bottle to maintain a superior environment for your aquatic pets. For new setups Ultimate® instantly "ages" water allowing you to enjoy your pets in action quicker without fear of the negative impact of toxic chloramine, ammonia, chlorine, heavy metals or nitrite. Directions To fully condition water for (1) new aquariums or ponds (2) after or during water additions, or (3) before adding new fish, amphibians, invertebrates or plants, add 1 teaspoonful (5 mL) of Ultimate® per 10 gallons of water. For larger applications use the following dosage: 1 oz per 60 gallons of water. Recommendations Perform regular water changes to keep the alkalinity (acid-neutralizing capacity) and pH stable. Use Ultimate® as needed to eliminate and control ammonia at the regular dosage rate for each 1 mg/L, or fraction therefore of measured total ammonia or for each 0.85 mg/L of measured total ammonia-nitrogen. Use a salicylate (indolphenol) type total ammonia test kit. For dissolved-oxygen (DO) testing use either a DO meter or an indigocarmine test. May be used at the regular dosage to stop or destroy permanganate treatments. Contraindications Do not use with permanganate-based or chlorate-based treatments. Nessler's total ammonia test will give false, high (or off scale) readings. Winkler dissolved oxygen tests will give false, low (or zero) readings. ClorAm-X is a unique, dry powder water conditioner that has been scientifically formulated to remove, and thereby detoxify, ammonia, chlorine and chloramines from water for use in all types of fish and aquatic invertebrate culture. Conditioning new water for aquariums, tanks, ponds, and live-haul containers. When adding new plants, invertebrates, fish or amphibians to an existing aquarium, tank, or pond. Live-haul containers, during transportation of live fish, amphibians, or aquatic invertebrates, to control and eliminate ammonia in the shipping water. To remove and detoxify ammonia, chlorine and chloramines from water for aquariums or ponds, to condition new tap water or for chlorine and chloramine removal, add 1 oz per 235 gallons of water. CyroPro is a ready-to-use, liquid concentrate that was developed to offer the hobbyist an effective way to control conditions caused by anchor worm and fish lice in their pond, freshwater or marine aquarium. Extremely safe and super effective this revolutionary product offers you rapid control yet will not negatively impact your biological filtration. Start treatment with a large water change (approximately 90%) or start with new water. This treatment refreshes dissolved oxygen levels, removes pollutants and nutrients for disease-causing organisms and reduces the population of water-borne pathogens. Water should first be conditioned with ULTIMATE or a combination of ClorAm-x & Stress-X to remove ammonia, chlorine and chloramines. Do not stop filtration, but remove activated carbon, stop protein skimming. Re-dose every 7 days for three continuous treatments. The prescribed water change is required before each treatment. Complete treatment will take 3 consecutive weeks. Any interruption in the treatment regime requires a restart. Do not use with any potassium permanganate treatments. The World's First Aquatic Treatment For Microbial Bacteria & Protozoan Diseases That Targets The Infected Areas & Includes A Skin-Slime Replacer To Speed Recovery! Bath Treatment As a bath treatment for external nitrofuran-susceptible, microbial diseases of marine and freshwater aquarium and pond fishes, use 1 capful (9.7g) per 10 gallons of water. A partial or complete water change should be made just prior to beginning treatment and every 24 hours thereafter, followed by re-treatment. Any water used should first be conditioned with ULTIMATEA® or a combination of Liquid Buffered ClorAm-® and Stress-X to remove ammonia, chlorine and chloramines. Repeat the treatment every 24 hours for 5 to 7 days or until complete cessation of mortalities occurs. If improvement is not noted within three (3) days, discontinue treatment and consider other therapy. Short-Term dip for Marine Fish Mix the proper amount of BiFuran+ into a container of conditioned freshwater and place the diseased fish into the container with gentle aeration. Allow the fish to remain in this dip treatment until they can no longer remain upright or show other signs of osmotic stress (typically no longer than 1 minute). After treatment return the treated fish to normal seawater for recovery. Repeat daily as needed. Oral Treatment For systemic (internal) infections, Bifuran+ can be fed mixed with fish food. Use BiFuran+ for microbial disease treatment for bacterial diseases or protozoan diseases for freshwater, marine or pond fishes. Avoid skin and eye contact. Avoid breathing powder or dust. Use in an area with minimal air movement to prevent blowing of powder or dust. In case of contact with eyes, rinse immediately with plenty of water for at least 15 minutes. Get medical attention. In case of skin contact, wash with mild soap and plenty of warm water. This product is known to contain detectable amounts of a chemical or chemicals known to the state of California to cause cancer/birth defects or other reproductive harm. BiFuran+ has been developed to offer assistance to aquarium or pond keepers who are encountering problems with bacterial or protozoan diseases who are looking for a safe and effective treatment. Stress-X was developed to offer the hobbyist an effective way to replace a lost slime-coat on freshwater, marine or pond fish while helping to reduce stress. Non-Toxic To Humans, Pets & Aquatic Life. Directions To condition water for aquarium or pond use add 1 teaspoonful (5 mL) of Stress-X per 10 gallons of water. Should be added to water before adding new fish, invertebrates, amphibians or plants. May be used daily, if needed. Excellent for use when shipping fish in bags. Liquid Buffered ClorAm-X utilizes a patented molecule to destroy chloramine and then removes the ammonia and chlorine. Gone are the days of hoping your biological filtration can remove the bound up ammonia before the health of your fish is impacted, a common process with most other ammonia removers. Look for the ClorAm-X logo and USA patent number to prove you've chosen the leader and most dependable ammonia remover available worldwide! Directions To remove and detoxify ammonia, chlorine and chloramines from water for aquariums or ponds, to condition new tap water or for chlorine and chloramine removal, add 1 teaspoonful (5 mL) of Liquid Buffered ClorAm-X® per 10 gallons of water. To remove ammonia in existing aquariums or ponds add 1 teaspoonful of Liquid Buffered ClorAm-X® to each 10 gallons of water for each measured 1.0 mg/L of total ammonia (=0.85 mg/L total ammonia-nitrogen). For protecting fish and aquatic invertebrates during shipping add 1 teaspoonful of Liquid Buffered ClorAm-X® to each 10 gallons of water for each expected 1.0 mg/L of total ammonia (=0.85 mg/L total ammonia-nitrogen). May be used at levels up to 10X the single dosage. Recommendations Use ClorAm-X® as needed to eliminate and control ammonia at the regular dosage rate for each 1 mg/L, or fraction therefore of measured total ammonia or for each 0.85 mg/L of measured total ammonia-nitrogen. Contraindications Do not use with permanganate-based or chlorate-based treatments. Nessler's total ammonia test will give false, high (or off scale) readings. Winkler dissolved oxygen tests will give false, low (or zero) readings. 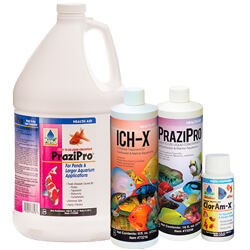 Quick Ich-X utilizes the most widely respected formulation for the treatment of ich, using a less toxic form of malachite green, which makes it less taxing on biological action and safe for scaleless and sensitive fish like Corydoras. Add 3 drops per 2 gallons of aquarium water. For best results (1) always treat in a separate quarantine/treatment tank, (2) remove activated carbon from filters and clean or replace mechanical filtration media (do not stop filtration! ), (3) make at least a 1/3 water change before each addition of Quick Ich-X® (use ULTIMATE® to condition new water), and (4) repeat treatments at least every 24 hours, but no more often than every 8 hours, depending upon the course of the disease. Continue uninterrupted treatment for three (3) days after visible signs of disease conditions cease. DO NOT OVERDOSE.